EbenezerDevotion is a Legacy Library. Legacy libraries are the personal libraries of famous readers, entered by LibraryThing members from the Legacy Libraries group. » Ebenezer Devotion's legacy profile. EbenezerDevotion is also an author. 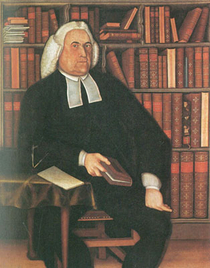 About meEbenezer Devotion (8 May 1714–16 July 1771), pastor of the Third Church in Windham, Connecticut (now Scotland, CT). He was born at Suffield, Connecticut (then part of Massachusetts), graduated from Yale College in 1732, and was ordained on 22 October 1735. He represented Windham several times in the General Assembly. Upon hearing of his death, Rev. Ezra Stiles called Devotion "a Gentleman of solid Understanding, extensive Reading, and eminent for every kind of Merit. A great Divine, a pious Man, an able Politician." Several of his sermons and essays were published. He married Martha Lathrop, 25 July 1738, and the pair had six children. About my libraryThe inventory of Devotion's estate is published in Robert F. Trent, "New London County Joined Chairs: Legacy of a Provincial Elite." Connecticut Historical Society Bulletin 50 (Fall 1985), pp. 193-194; that is the starting point for the books included here. Sixty-nine volumes and 230 pamphlets, however, are unidentified by title. Devotion's portrait (pictured here) by Winthrop Chandler uses Rev. Devotion's library shelves as its backdrop; for more on this, see Kevin J. Hayes, "Portraits of the Mind: Ebenezer Devotion and Ezra Stiles (New England Quarterly 70:4 (Dec. 1997), pp. 616–630. Hayes identifies a few more titles from the portrait. Questions? Comments? Concerns? Do you know of additional extant Devotion books which should be included here? Please contact Libraries of Early America coordinator Jeremy Dibbell.